Authored by: Julie Kerr, Ph.D. Global warming has increased dramatically during the last century at an unnatural rate, which makes specialists believe that humans contribute to the real cause of global warming today. Many activities humans are involved in—from burning fossil fuels for energy to massive deforestation—are contributing to the atmospheric warming at an alarming rate. Experts believe that, in the future, human-induced damage will cause severe problems in the distribution of species and their critical habitats, increase the occurrence of severe weather and droughts, contribute to rising sea levels, and trigger a host of health and quality-of-life impacts that will affect everyone on Earth. Unfortunately, no ecosystem will escape the impact of human-induced global warming. 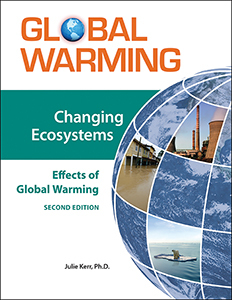 Thoroughly updated and featuring new graphs, charts, and illustrations, Changing Ecosystems, Second Edition looks at this serious issue and the far-reaching effects it is having right now, and will have in the future, on every ecosystem on Earth. It is crucial that readers understand the relevant issues now so they can prevent this problem before it is too late and many species and habitats are gone forever. By discussing the effects of global warming on ecosystems, this eBook enlightens students on the many ways they can become more eco-responsible now and in the future. Conclusions—Where to Go from Here. Julie Kerr, Ph.D., has been an Earth scientist for the United States Bureau of Land Management for more than 40 years. She has a Ph.D. in Earth science from the University of Utah, specializing in satellite remote sensing, interpretation, and mapping of the Earth's natural environment. She is active in various environmental conservation organizations that focus on the healthy stewardship of the Earth's natural resources and has spent time teaching elementary through college students how to enjoy and take care of the environment. She has also been involved in teaching both young people and adults about the Earth's changing climate and the things we can do to help slow the changes and make a positive difference for more than a decade.